CSL Resource Kits are bundled tools and materials that enable you to provide new and exciting programming that engages with your community in new and interesting ways. Whether you are looking for activities for babies and toddlers to promote literacy at an early age, or want to help your young patrons learn more about archaeology and fossils, the kits will provide a doorway to learning and experiences that are new and fun, as well as educational. Library staff can also take advantage of the kits to gain awareness of social issues facing our communities, and become more aware of identified under-served populations and how to work with these patrons more successfully. Our kits are loanable, usable, and help you not only learn something new – but pass that learning on to your patrons. Check out the kits and see how they might be useful in your library at our web site. 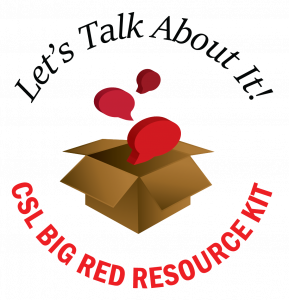 New “Let’s Talk About it: Big Red Resource Kit” available for Colorado Libraries. “Let’s Talk About It!” – Community Conversations in a Big Red Box.